National Geographic's Annapurna, Nepal AdventureMap is designed to meet the unique needs of adventure travelers, highlighting hundreds of points of interest and the diverse and unique destinations within the country. Every AdventureMap is printed on durable synthetic paper, making them waterproof, tear-resistant and tough - capable of withstanding the rigors of international travel. Each is two-sided and can be folded to a packable size of (4.25" x 9.25"); unfolded size is (26" x 38"). - Updated regularly to ensure accuracy. Map Scale = 1:135,000 .
. National Geographic's Everest Base Camp AdventureMap is designed to meet the unique needs of adventure travelers, highlighting hundreds of points of interest and the diverse and unique destinations within the country. Every AdventureMap is printed on durable synthetic paper, making them waterproof, tear-resistant and tough - capable of withstanding the rigors of international travel.
. 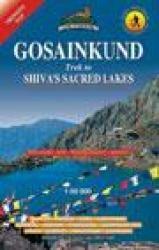 This topographic map covers this popular hike from Kathmandu to Gosainkund Sacred Lakes. The map covers Kathmandu, Trisuli Bazaar, Betrawati, Ramche, Grang, Thare, Bokajhunda, Dhunche, Bharkhu, Syabru, Chandrabari, Shin Gomba, Lauribinayak, Gosainkund. Folded map of the Himalayas, including: Tibet, Kashmir, Nepal, Sikkim, and Bhutan. Printed on waterproof, tear resistant, PolyArt paper. .
. A stunning. 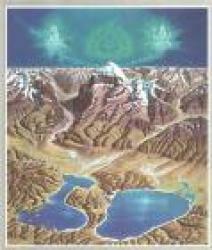 handpainted picture depicting Mt Kailash and the neighbouring peaks and lakes, as seen from an elevated, north-facing viewpoint. Annotated to highlight peak heights, base camps, settlements and trails.
. National Geographic's Khumbu, Nepal AdventureMap is designed to meet the unique needs of adventure travelers, highlighting hundreds of points of interest and the diverse and unique destinations within the country. National Geographic's Langtang, Nepal AdventureMap is designed to meet the unique needs of adventure travelers with its durability and accurate information. This folded map provides global travelers with the perfect combination of detail and perspective, highlighting hundreds of points of interest and the diverse and unique destinations within the country. Every AdventureMap is printed on durable synthetic paper, making them waterproof, tear-resistant and tough - capable of withstanding the rigors of international travel. 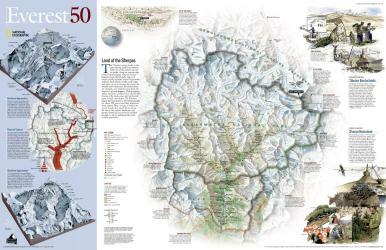 .
. As seen in the May 2003 issue of National Geographic, this double-sided map celebrates the 50th anniversary of Sir Edmund Hillary's ascent to the summit of Mt. Everest. Side one features a digital rendering of Mount Everest created from infrared images taken by the space shuttle combined with stereo photographs taken from a jet aircraft. The work of generations of surveyors-stretching back to the days of George Everest himself-undergirds like bedrock this most detailed digital model of Mount Everest. The reverse side shows a map of Sagarmatha National Park and surrounding areas. Inset maps and informative sidebars describe the Sherpas, special locations in the area, the growth in visitors to the region, and the routes taken by famous Everest expeditions. Wondering what to read when visiting the Himalayas?